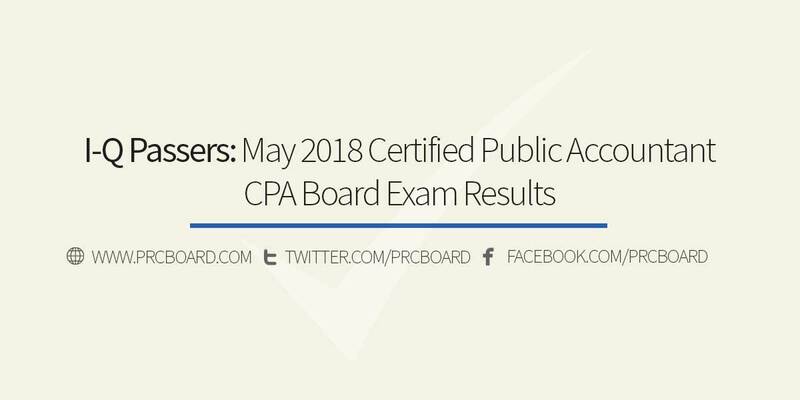 MANILA, Philippines - The official results, list of passers, top examinees, performance of schools and other important announcements for May 2018 Certified Public Accountant (CPA) board exams are released by the Professional Regulation Commission five (5) working days after the last day of exams. Below is the list of passers for May 2018 CPA licensure with surnames starting with letter I to Q.
Goodluck kuya. God is wth u.
Ang tagaaaaal . Wat time po ang release? relax lang. malalaman din natin 2day. GOD BLESS MY 2 BROTHERS na umatend at sa mga nag test. Gudlak nikka mendoza. God is with us. WHAT TOOK PRC TOO LONG TO PUBLISH THE CPA PASSERS. Gooood Luckkk Mae Angela Kong!!!! Hi Admin, Anong oras po out nung results? Eneh bey!!! Utang na loob!!! "All things are possible in your name"
meron na po bang result??? 😭😭😭 The stress and agony..
nilalaganat na ako kakahintay, wala pa akong kain simula kaninang umaga. Admin, please release the result already. Ilabas na yan please. Tortured na ang mga takers!